MajorTommy is a pop singer/songwriter who admirably prefers to let his music do the talking. All we know about him so far is that Major is a nickname he has had for a long time. His music is best described as sophisticated pop akin to Coldplay and Sam Smith, though vocally he sounds more similar to a cross between OneRepublic’s Ryan Tedder and the throaty vocal style of Jon Bon Jovi.. This EP, No Flight nor Fear, consists of four tracks, all produced to a very high standard. The opening song Honey begins with pulsing Viva La Vida-style low end strings (a 60 piece orchestra recorded in London) which sets the tone for the entry of Tommy’s distinctive and captivating lead vocals. The lyrics are inventive and slightly ‘off the wall’ for mainstream pop: “We made another funny home made video, we keep on laughing at the story even though it ain’t that funny and our jokes, they kind of blow….”. It’s an original way of approaching a love song, and leads to a strong, anthemic chorus. The tracks builds up in the second verse and truly explodes during the second chorus, the sound as big as Coldplay or U2 at their most epic. It’s an excellent song and an obvious choice as the lead single from the EP. The high standard continues with second track Tell Me, a more mellow and melancholy ballad that starts with a tapped bass guitar arpeggio. Tommy’s vocals here are more gentle and sensitively delivered, showing his artistic versatility. The languid pace and sparse arrangement allows the vocals to shine and the emotional resonance of the lyrics to be conveyed: “I know that it’s certain we won’t stay the same if you won’t tell me anything…”. A touching song that many people will relate to, with some fine extemporizations towards the end. The following Slow Motion is another ballad but this one takes us back into the realms of the epic. It’s a huge emotive love song that wears its heart on its sleeve, Tommy giving a stellar vocal performance comparable to Bon Jovi’s wedding song classic Always. The strings again play a strong supportive role, with a swirling Toxic-esque arrangement. Another potential single, undoubtedly. I Don’t Wanna Go is another very well written that sits halfway between the previous tracks. Starting with flowing classical-influenced piano and strident use of strings, it gradually develops into a powerful pop track that brought to mind the Will Young classic Your Game, with another standout vocal performance. Lyrically, it’s a hugely emotive and honest depiction of the internal conflicts that many relationships encounter. Remarkably, for the last song on an EP, this is again a potential single. Overall, this is an extremely impressive four songs from a currently enigmatic artist whose music can stand on his own merits. As a songwriter, he has emerged fully developed and is blessed with a charismatic and recognizable voice. With a radio friendly sound and flawless production, he has everything it takes to compete with the mainstream pop luminaries of this era. 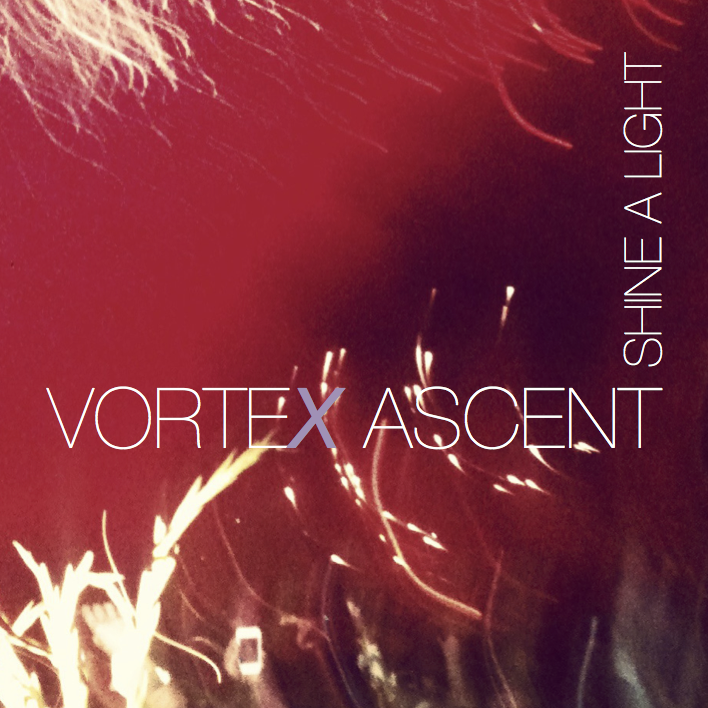 Vortex Ascent are an alternative musical collective that was founded in 2006 by Brendan Lynch and Derek Schuurman. The concept was to develop an experimental collective of solo musicians around the world, with each musician recording their compositions independently at the same recording studio. It was produced by Andy Rugg (who engineered on Coldplay early albums) and features input from musician/critic Paddy Bush (brother of Kate Bush) as well as author/speaker Cathy O’ Brien. The style of the music varies from track to track and artist to artist, but the music could generally be described as alternative or dreampop. Opening track Dodging Bullets weaves an evocative and ethereal soundscape on the solid base of a static electronic beat and pulsing synth bass. Derek Schuurmans’ dreamy vocals float on top a sea of atmospheric synths and pads, with choral voices and spoken word samples drifting in and out. His voice is perfectly suited to the genre and the music is intriguing throughout, defying conventional song structure and constantly shifting under your feet, with the chords never going quite where you might expect. The same might be said for the rest of the album, so it is perfect as an introduction. Second track This Unknown, by Derek and singer Sarah K. Panton, is a marked contrast to the song that precedes it, being much more sparse. It consists of just piano and vocals, though the liberal use of reverb and delay creates a magical, cavernous sound which proves the rule that less is more. The song is hauntingly beautiful, with Sarah K. Panton’s crystalline vocals quite astonishing in their range and expressiveness. It recalls the more other worldly moments of Kate Bush (something from The Ninth Wave, for instance). Third song For What It’s Worth by Low Monotone is another contrasting track, though again quite sparse, just male vocals and chugging early Coldplay style clean guitars. Again, the vocal style is perfect for this brooding, melancholic piece. Next comes female singer/songwriter Sygnet’s Dream Lover, a lovely acoustic ballad that is beautifully sung and performed. It is one of the more conventional offerings on the album though still fits in well with the material that surrounds it. Mart Giebner’s Catch Me is another acoustic ballad but this song has a jazzier feel (a sax solo features on the fade) and an appealing emotional vulnerability, Giebner asking “Are you gonna catch me when I fall?“. It is one of the best songs lyrically, leading then to the album title track by Nigel Homer and female vocalist Briar. Her voice is somewhat reminiscent of Florence Welch and the song itself is rather modern sounding with a pulsing electronic groove. This is counterpointed nicely by some bluesy guitar work. Next comes A Walk In The Park by Gila Chaya and Derek Schuurman, my personal favourite on the album. It is a gorgeously cinematic piece of music, remarkable for the way it musically evokes the song title (replete with appropriate sound effects). Gila Chaya’s celestial vocals float across a haunting slow jazz backing, with saxophone echoing in the distance occasionally. It is the track I will be playing most often, a true classic of its kind. A short, melancholy but lovely instrumental called Fatigue (about emotional exhaustion) from Low Monotone leads to another stunningly sung track, So Long, Summer by Lonely Yoko (a duo comprising of songstress Kanna Sasaki and Nigel Homer). It shares a similar hymnal quality with A Walk In The Park, featuring some breathtaking layered vocal harmonies. A distinct change in mood arrives with the tenth song Dark Skies by Sarah K. Panton, Tony Rogan and Dan Moody/Glow. As the title implies, it has a saturnine, claustrophobic, almost gothic atmosphere, bringing to mind the dark electronica of Massive Attack and Portishead or the more recent work of Radiohead. The spectral quality of the vocals contrasts well with the ominous intensity of the musical backing. It is said to be partly about the war situation in Syria, a brave subject to tackle in a song. The sombre mood continues with La Dame Blanche, a haunting instrumental from Parisian musician David Floc’hlay. It was apparently inspired by the legend of a hitch-hiking ghost called The White Lady and the music is suitably enchanting and mysterious, bringing to mind the work of Twin Peaks composer Angelo Badalamenti. After these several excellent but rather gloomy tracks, the dark mood reaches its nadir with Down The Rabbit Hole, which is about and also features the author/public speaker Cathy O’ Brien. She is a survivor of mind-control perpetrated by Mk Ultra, a faction of the CIA. The excerpts from her speeches give a harrowing realism and power to the poignant music, and tackling such a serious subject matter should be highly applauded. After that, the mood does lighten somewhat with End Of The Road, another acoustic ballad from Mart Giebner. It has a world-weary tone in the lyrics, almost pleading “tell me everything is gonna be alright….”. This brings us to the final song Dodging Arrows, the second part of the song that begins the album. Though musically similar, lyrically it is more hopeful and optimistic, bringing the album full circle in a satisfying way. Overall, this is an unusual but extremely accomplished album, highly eclectic in its various styles and genres yet manages to be remarkably cohesive and coherent. It takes the listener on an emotional journey and isn’t afraid to confront the darker aspects of life, giving it a depth lacking in so much modern music which has mostly become ‘bread and circus’ entertainment. I expect Vortex Ascent to gain a devoted following and critical acclaim in the future provided they receive enough exposure.